A dealer from Australia had this copy for sale- which I just received. 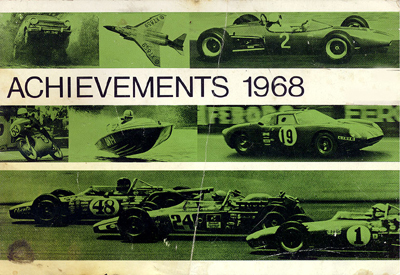 I had thought that by 1968, all of the Castrol Achievements books were full-size. But no. This one measures 8 1/2 inches wide by just under 6 inches high. The images are similar to the larger version, and the text is similar as well. But there are differences. Still, not many Lotus Cortinas appear- a few black and white photos, and also the odd schematic drawing from the larger version, of the London to Sydney rally car, but smaller and in fewer colors. All in all, I prefer the larger, more colorful copy. Original copies are rare. The page paper discolors and turns brittle with age. Booklets are only available from collectors.